Black Sabbath touring in 1999 has four distinct parts. 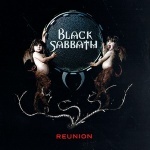 The Reunion Tour – these shows were officially to support the Reunion album. 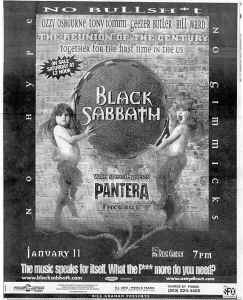 Ozzfest ’99 – Sabbath headlines the annual Ozzfest. Vinny Appice was on tour with the guys “just in case” (those words are from the tour program). The “just in case” was in case Bill Ward couldn’t ‘handle it’. These gigs were originally planned back in Nov 98, and then cancelled before tickets went on sale: Anaheim, CA (Jan 7), State College, PA (Feb 1), Montreal Canada (Feb 11). The Philadelphia PA gig originally scheduled for Jan 28 was postponed to Feb 18th. The Pittsburgh PA gig originally scheduled for Jan 29 was postponed to Feb 19th and became the last show of the tour. The Salt Lake City gig was originally scheduled for Jan 14th, then postponed to Feb 23rd, and then cancelled. The Denver gig was originally scheduled for Jan 15th, then postponed to Feb 21st, and then cancelled. The Buffalo gig was originally scheduled for Feb 1st, then indefinitely postponed, and then cancelled. Towards the end of the tour there were a couple of gigs rumoured to happen in Tenessee, but they didn’t occur. There were three gigs added and then cancelled in the same wave of cancellations that affected Buffalo, Denver, & Salt Lake City. These gigs were Peoria IL (Feb 25), Ames IA (Feb 26), & Fargo ND (Mar 2). 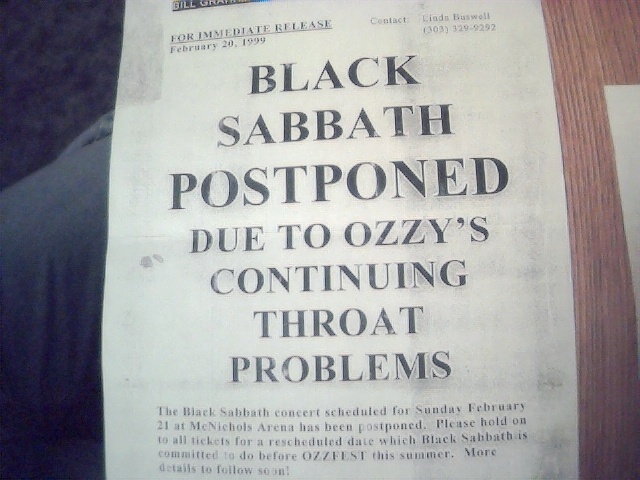 All of these cancellations were due to problems with Oz’s voice (throat nodule(s)). I’ve also got a photo gallery with 81 pictures from backstage on Ozzfest 99. If you want to check them out, click the photo below.